Did you know that there are only 11 weeks until CJ’17? I am very excited and you should be too! This week-long adventure will be an exciting challenge for everyone attending. What you probably don’t know, is that it’s on the Canadian Path! 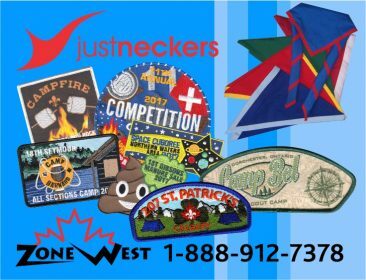 So, you are not only attending CJ, you’re also taking a trip along the Canadian Path, expanding your horizons, and creating lifelong memories with your Patrol. Before you even arrive on site, your Adventure will already have begun. Preparing, fundraising and even packing your equipment are all a part of the journey. Before a trip, it’s always important to plan your Adventure. By doing this preparation, you are also completing a part of the Scouting Program. As they always say -Be Prepared. The preparation is a lot of fun too. For me, I particularly enjoy making decisions about activity selections, and going on pre-camps to practice for the real thing. How will you be getting to CJ? My Troop will be going two different ways. One Group is taking the train from Ottawa to Halifax, and they will be travelling for almost 24 hours! The other Group, the one I’m a part of, will be taking a plane to the campsite in Nova Scotia. My biggest challenge will probably be trying to fit all of my stuff into my carry on! Travelling between Provinces and taking note of the cultural and geographical differences will be a rip-roaring experience, but the most important thing on my mind will be my arrival at the Camp. I’ve been looking forward to it for over a year. The Camp itself is the biggest part of our Adventure, and the most fun. It’s what we‘ve planned, fundraised, and traveled so far for. During the week-long Camp, we will get to try challenging activities in Halifax, such as the Amazing Race or deep sea fishing. The time we spent practicing our camping skills will probably come in handy while we share a campsite with thousands of Scouts. During our free time, I look forward to meeting Scouts from all around Canada, and trading Camp Crests with them. But most importantly, I look forward to creating new bonds and friendships. Throughout our Adventure, we will progress through our Scouting journey, while having a great time with our Patrol. Expert campers always review their exploits, so after returning home from the Jamboree, our Patrols will review the trip, share experiences, and come up with ideas for our future Adventures. Our entire Troop will have experiences to share, and stories to tell. Even as they become distant memories, I know my adventures in Halifax will always remain in my heart. This July, thousands of Scouts from around the world will meet in Halifax, Nova Scotia for a week-long adventure down the Canadian Path, where new friendships will be forged, memories will be made, and stories will be passed on. I can’t wait to see you there!